UMX Compact Size and Swingable Safety Breakaway Buckle For 3/4" Lanyard Straps. Great Add-On Safety To Your Existing Lanyards. The LY-CC507-SW safety breakaway buckle is a unique design for 3/4" lanyard straps. This compact size and swingable safety break away buckle is very easy to install. You can buy this safety buckle to install onto most of lanyard straps on the market. If your current lanyards don't have breakaway safety function, you can try our compact size and approximate 280 degree swingable safety buckle LY-CC507-SW. The swingable safety break away buckle not only can be used as safety breakaway buckle, can be use as connection buckle for wrist lanyards. A great buckle for your safety lanyard and wrist lanyard application. By using our LY-CC507-SW buckle, you can create, design and make your own style of safety breakaway lanyards easily. The LY-CC507-SW safety breakaway buckle is not only designed for neck strap, it can be used on wrist strap as a connection buckle with breakaway function too. If you are going to design your own wrist strap with an easy put on or easy take off function then LY-CC507-SW is a great choice for you. 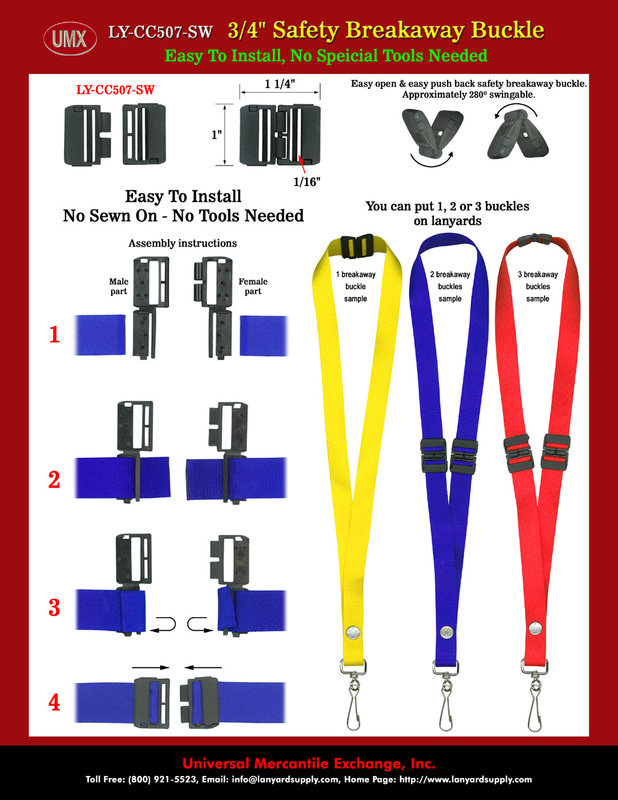 You are viewing Lanyards > Snap Closure > Easy-Add-On Safety Breakaway Buckle For 3/4" Lanyard Straps.